Building a bat house can be a very rewarding project. Bats are an invaluable resource. Yet, due to many years of unwarranted fear and persecution by humans, bats are declining at an alarming rate. You can help significantly by building and putting up your own bat house. You will benefit by having fewer lawn and garden pests and have fun sharing your experiences and knowledge with friends and neighbors. Few efforts on behalf of wildlife are more fun and rewarding than helping bats. The picture of the bat emergence was taken from a recent trip to the Old Tunnel Wildlife Management Area. 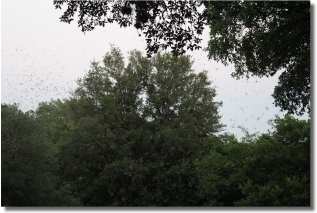 At almost precisely 8:37pm on 6-24-11, the bats emerged from the end of the tunnel, circled around for about a minute, then began to head upwards, over the trees, and towards the nearby Guadalupe river (check out the video below). The entire show (the night we were there) only lasted about 5 minutes, but was nothing short of spectacular! The tunnel is home to mostly Mexican free-tailed bats, but there is also a small population of cave myotis. Bats can be found living in almost any shelter, though they are mostly known for living in caves. In the Austin-Round Rock, Texas area, there are huge populations of bats living under bridges. In Austin, crowds gather frequently at dusk to watch approximately 1.5 million Mexican free-tailed bats depart from under the Congress Avenue bridge. In Round Rock, another smaller bat colony resides underneath the I-35 overpass at McNeil Road. This location also provides a very spectacular show at sundown. Bats are the primary predators of night-flying insects, and play a vital role in the balance of nature. They are probably the most valuable allies of humanity, because of the vast numbers of pests they consume. Check out this video of the bat emergence at the Old Tunnel WMA on June 24, 2011. This particular bat emergence lasted about 5 minutes. A single brown bat can consume hundreds of mosquitoes in an hour! A typical colony of 150 big brown bats can protect farmers from the costly attacks of 33 million rootworms each summer. They also consume other well known pests such as, cucumber and June beetles, stink bugs, leafhoppers, and cutworm and earworm moths. These are just a few of the many benefits of bats. As you can see, building homes for bats can be one of the most beneficial small woodworking projects. I hope you enjoy building a bat house as much as I did. Some of the information in this article was obtained from "The Bat House Builders Handbook", by Merlin D. Tuttle and Donna L. Hensley. For more information on bats and their habitat, please visit www.batcon.org.